BIG SALE!! GEMSTONE FISH CARVINGS BIG SALE!! Large hand carved Sharks in Black Obsidian from the volcanic bowels of Mother Earth. The power stone Black Obsidian has been used for centuries by crystal masters to banish grief and encourage happiness and good fortune. Large Tiger Eye Shark carving shimmers from every angle. High quality, high polish, iridescent Tiger Eye energizes the body and focuses the will. The shark is a perfectly evolved creature, the undisputed ruler of it's world, except for humanity. 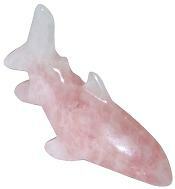 Beautiful Rose Quartz Shark carving. Rose Quartz is called the Lover's Stone because of it's beauty and gentleness, it is used to radiate soothing love energies to promote calm and contentment. The shark is a perfectly evolved creature, the undisputed ruler of it's world, except for humanity. 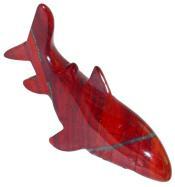 Large Red Jasper Shark carving. The shark is a perfectly evolved creature, the undisputed ruler of it's world, except for humanity. Red Jasper is said to be a stone of justice, assisting to rectify unjust circumstances. It is often used as a stone of protection. Hard to find large Shark carving in Unakite. Unakite is a crystallized form of pink Feldspar, green Epidote and Quartz. Unakite is said to clear blockages to physical and personal growth and speed development of one's goals. Adorable large Seahorse carving in Green Aventurine. The seahorse is a mysterious creature who often represents an ethereal, peaceful and contented spirit in human culture. Aventurine reinforces decisiveness, amplifies leadership qualities and enhances instinctive reaction in difficult situations. Shimmering large Seahorse carving in chatoyant Tiger Eye. The seahorse is a mysterious creature who often represents an ethereal, peaceful and contented spirit in human culture. High quality, high polish, iridescent Tiger Eye energizes the body and focuses the will. Adorable large Seahorse carving in Red Jasper. Red Jasper is said to be a stone of justice, assisting to rectify unjust circumstances. It is often used as a stone of protection. The seahorse is a mysterious creature who often represents an ethereal, peaceful and contented spirit in human culture. Beautiful Rose Quartz Seahorse carving. Rose Quartz is called the Lover's Stone because of it's beauty and gentleness, it is used to radiate soothing love energies to promote calm and contentment. The seahorse is a mysterious creature who often represents an ethereal, peaceful and contented spirit in human culture. 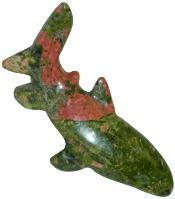 Adorable large Seahorse carving in Unakite. Unakite is said to clear blockages to physical and personal growth and speed development of one's goals. The seahorse is a mysterious creature who often represents an ethereal, peaceful and contented spirit in human culture. Dolphin carving in rare Gold Ocean Jasper. It's single source lost since 1922, Ocean Jasper was rediscovered off the coast of East Madagascar! The colorful orbicular formations and quartz crystal inclusions in a jasper matrix, make this a dramatic new collectible. Rare Malachite crocodiles, exquisitely hand carved in premium Malachite from Africa. Each piece is hand picked for the beauty of the stone and artistry and these have very fine details. Malachite was prized by the ancient priests of many cultures as a power stone allowing intuitive insight and guidance on the spiritual journey of transformation. Beautiful Pink Rhodonite in Quartz Seahorse carving. Rhodonite has a lovely pink matrix which has intergrown with milky quartz to create this attractive stone. It is said to balance the yin-yang energies and assist in the attainment of one's greatest potential. The seahorse is a mysterious creature who often represents an ethereal, peaceful and contented spirit in human culture. Large Green Aventurine Shark carving. The shark is a perfectly evolved creature, the undisputed ruler of it's world, except for humanity. Aventurine reinforces decisiveness, amplifies leadership qualities and enhances instinctive reaction in difficult situations.